Out of the Past - Live! 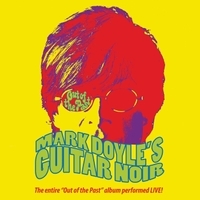 Captured with 4 HD cameras and mixed in 5.1 Surround, this double-DVD captures guitarist extraordinaire Mark Doyle performing the entire "Out of the Past" album with a 10-piece band (including a string quintet) at Auburn Public Theater in 2015. In 2001 Mark Doyle released his solo album “Out Of The Past,” described as “an all-instrumental modern reinterpretation of a time when theremins, fuzz guitars and vibraphones all melded together into a psychedelic melting pot.” Fourteen years later, on April 4, 2015, Doyle performed the entire album live at Auburn Public Theater with a ten-piece band including a string quintet. The show was captured with four HD cameras and recorded multi-track and mixed in glorious 5.1 Surround. I posted this message immediately after experiencing this DVD,"For you music lovers out there, who aren't locked in a genre, I highly recommend going to Mark Doyle.com and dropping $20 on his "Guitar Noir" 2-DVD set. It's awesome! You don't have to know of Mark, or be from Auburn, to enjoy this masterpiece performed live in front of a packed house of 200." This live performance openly displays Mark's compositional genius while offering a view into his soul. Just awesome. Amazing live concert with the string quintet brilliantly arranged by Mark adding entirely different feel to every tune. The band faithfully recreates the Guitar Noir albums. Mark's guitar playing is just magnificent. Still I'm Sad, Little Niles and the Lonely One have never been played live before and Mark just kills it. Amazing how he is to get all the different sounds on his guitar on every tune. Mark's rendition of When I Fall in Love is worth the DVD alone. All this in a great surround sound / stereo mix.